By V-E Day the military government carpet was laid in dimensions larger than any plan had contemplated. It stretched across the Rhineland and the Ruhr into central Germany to the Elbe and the Mulde Rivers, into western Czechoslovakia to Pilzen, and south into Austria past Linz, Salzburg, and Innsbruck. The carpet was a thin one, 250 ECAD military government detachments and about 200 provisional detachments drawn from the combat troops.1 Although the movement and the fighting had ended, military government command was still entirely in tactical channels-from division to corps to army to army group. Fifteenth Army controlled the Rhineland. On 11 May, when First Army became non-operational, Ninth Army assumed military government responsibility for the area east of the Rhine and north of the Main River and for the Bremen enclave. Third Army held northern and eastern Bavaria, the western Sudetenland in Czechoslovakia, and a dozen Landkreise in Austria. Seventh ,Army straddled half of Bavaria (including Munich, the capital), Wuerttemberg, and Baden. Headquarters, 12th Army Group, took command of Seventh Army on 16 May and therewith became responsible for military government in all U.S.-occupied Germany. The U.S. Group Control Council, resigned to a delayed entry into Berlin, enjoyed an advancement from the rearward ranks of SHAEF Main, at Versailles, to a spearhead position with SHAEF Forward, in Frankfurt. When SHAEF Forward opened in the I.G. Farben building in Frankfurt after V-E Day, the US Group Control Council set itself up in a Farben plant in nearby Hoechst. 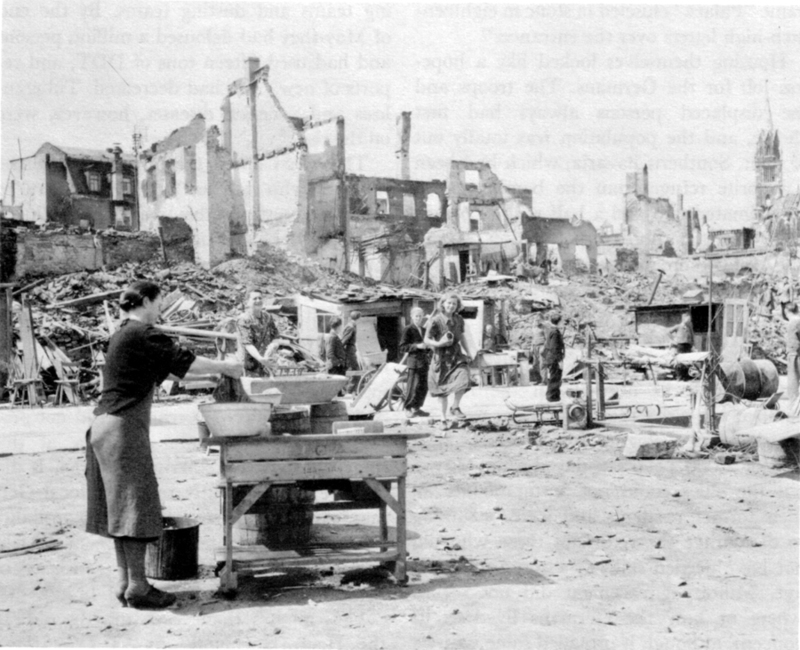 Hoechst, a Farben company town, was ideally suited to a military occupation. The houses had been designed for assignment to Farben employees according to rank. Headquarters, EC AD, moved from Troyes to Bad Homburg, ten miles northwest of Frankfurt, and settled into a collection of resort hotels spared from the bombing because they had been used as hospitals during the war. MFA&A was one of the first military government functions to be centrally coordinated. Because of the shortage of personnel, its functions had not been delegated to lower staffs to the extent others had; moreover, it had become the trustee for a greater quantity of art treasures than had ever been captured by any other army in history. At the time of the surrender, although they did not know it yet, the US armies held the contents of all the major German art repositories except the Hamburg museums and, apparently, nearly all the art work the Nazis had looted in the countries occupied by Germany. The march into the south had uncovered dozens of caches, among them Einsatzstab Rosenberg loot at Neuschwanstein, the Rothschild collections at Herrenchiemsee, Nazi Foreign Minister Joachim von Ribbentrop's collection at Gaibach, and, in Austria, mines at Laufen and Alt Aussee-the first mine containing the collections of the Vienna Kunsthistorischesmuseum, and the other holding the best of the Einsatzstab Rosenberg loot, probably intended originally for the great museum Hitler had planned to build in his hometown, Linz. 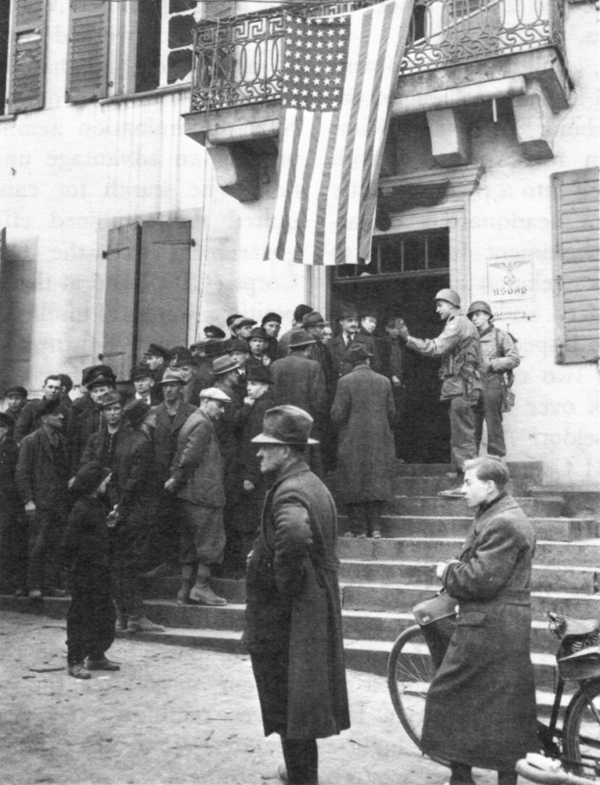 GERMANS QUEUE UP for information and advice at a military government detachment headquarters. ers. When the MFA&A officer, Lt. James J. Rorimer, went into the mines in late April, he saw, in cavernous galleries 700 feet below the surface where the temperature never varied from 67° Fahrenheit in winter or in summer, thousands of paintings and works of sculpture, millions of books, all the stained glass from the Strassburg Cathedral, the crown jewels and throne of the Grand Duchy of Baden, and, in addition, an I. G. Farben poison gas factory, a Heinkel jet plane factory, locomotives, fireworks, and stores of oil and aluminum. Organizationally, military government was most advanced in the area longest occupied, the Rhineland. After the Ruhr pocket collapsed in mid-April, Fifteenth Army converted itself into a predominantly military government headquarters by assigning military government functions to all its staff sections-religion and welfare to G-1, public safety and censorship to G-2, finance to the inspector general, and so on. The army's two corps, XXII and XXIII Corps, took over subareas-XXII Corps in the Duesseldorf-Aachen-Cologne districts, and XXIII Corps from Trier and Koblenz south. Early in May, the army brought in Detachments E1A2 and E1G2 to organize German provincial and district governments and at the middle of the month installed Dr. Hans Fuchs as head of the German administration for the entire Fifteenth Army area, then designated as the Rhine Province Military District. For a brief time Fuchs became the highest ranking German official in the western zones (his province was soon to be divided between the British and French zones). at the regional level. 9 By the end of the month the E detachments arrived east of the Rhine and began to organize German administrations up to the Land level. But Eisenhower's instructions did not affect the so-called tactical theory of military government that SHEAF G-5 had criticized in the field survey in March. From top to bottom in the SHEAF-occupied area, military government remained tightly locked into the tactical command channels. This arrangement meant that, except in the Rhineland where Fifteenth Army had assumed the characteristics of a military government staff, military government and the German administrations had to function within unit boundaries, not German political boundaries, and that down at least to the regiment and battalion level, tactical commanders had more military government authority than any military government detachment. The E detachments could organize German administrations, but the chances of their authority, to say nothing of the German officials' authority, reaching across the nearest corps boundary were not good. Although, with the war over, units no longer were constantly on the move, they still moved frequently and cultivated their own, sometimes idiosyncratic, concepts of military government. already been closed for several months and some, like those at Aachen, since September 1944. In the defeated country, about all the children had in abundance were temptations. Before the surrender, military government had picked up reports of nationally organized adolescent gangs going by such names as Snake Club, Red X, and Edelzveisspiraten. Their activities had ranged from listening to swing music and wearing zoot suits, to laughing and applauding in the wrong places at Hitler Youth meetings, to draft dodging and petty gangsterism. They were likely to find new things to do and many recruits if the occupation left the children unsupervised. 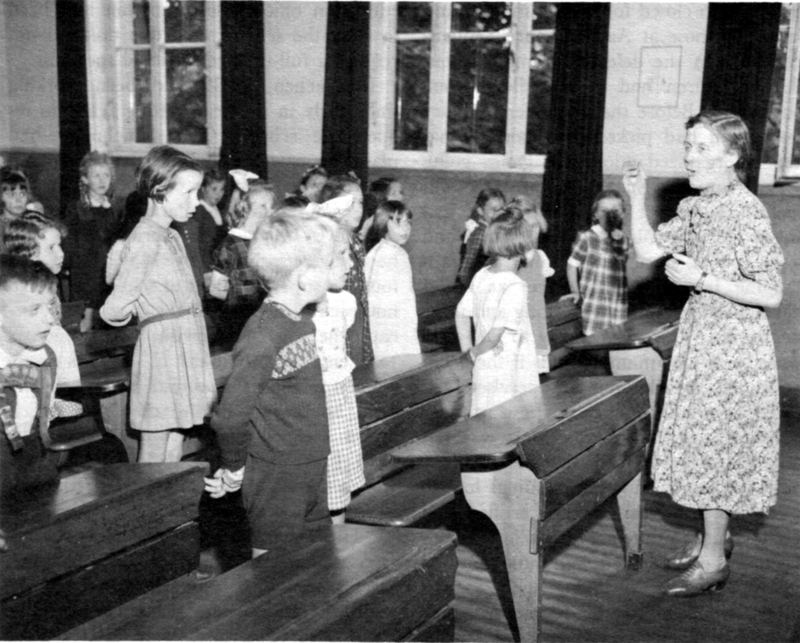 Like everything else in postsurrender Germany, reopening the schools was not easy. SHAEF required that before they could be opened, suitable buildings had to be readied, non-Nazi teachers certified, and new textbooks printed. Many school buildings had been destroyed, and those that had not were nearly all being used as DP camps, troop billets, or hospitals. Many teachers could not survive the first hurdle, the denazification Fragebogen. None of the old textbooks were considered suitable, and just to reopen the first four grades in the 12th Army Group area would require printing six-and-a-quarter-million new textbooks. Since it was not difficult to imagine the publicity effects of slips in the textbooks or the appointment of a few stray teachers with questionable political antecedents, military government would have to provide intensive supervision, which it was not ready to do. The E detachments had spaces for three education officers in their tables of organization and the F detachments spaces for two; in May, however, only one E detachment and no F detachment had an officer who carried education as his first assignment. During the war, the education officer's sole function had been to close the schools, and this task did not require a full-time educational specialist. After the surrender, PWD became suddenly and uncomfortably aware that it had a rival in the east, the Soviet-operated Radio Berlin. The Germans were listening to it more than would have been expected even considering that Radio Berlin was on the air in German nineteen hours a day while Radio Luxembourg's German-language broadcasts were limited to about four hours a day; and PWD listened, too, to find out why. What it heard were variety programs, music, friendly chats with listeners, and announcements of movies and theaters reopening and of alleged special coffee and tea rations. One morning music program was entitled "Let's Start the Day With a Gay Heart," and the announcer advised his listeners, "For greater pleasure, you should listen on your balcony amid flowers." On 22 May, the day the Russians put Berlin on Moscow time, the announcer who read the notice concluded with "Therefore, my dear listeners, you must not forget to set your clock forward an hour before going to sleep." 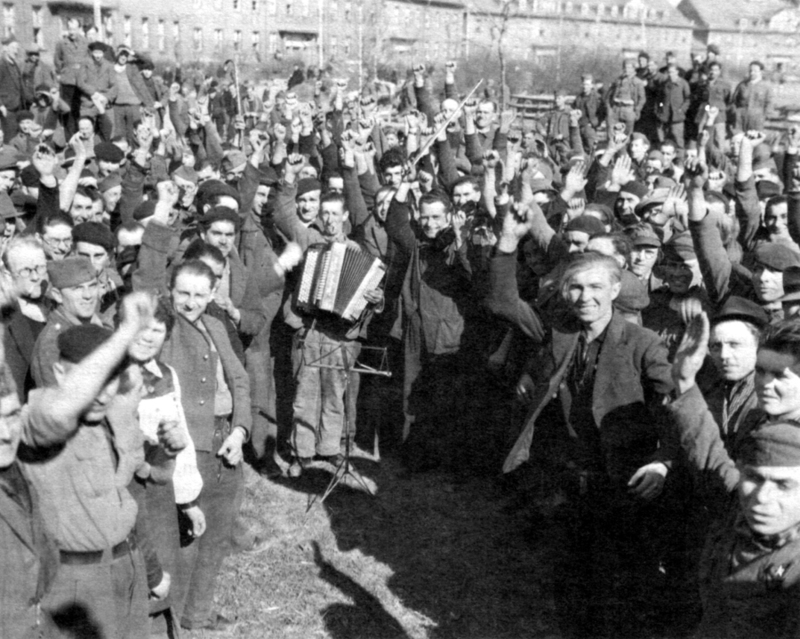 The PWD monitors noted a sharp contrast with US policy announcements and an even sharper contrast in tone.32 When PWD asked 12th Army Group how extensive the popularity of Radio Berlin was and what could be done about it, the army group replied that the Soviet programs were the main topics of conversation of Germans in all walks of life. Germany's military power is destroyed. The Nazi Party is dead. More than 20 million Germans are homeless or without adequate shelter. The average basic ration is less than 1,000 calories. Since JCS 1067 was a US directive, and hence technically not in force during the period of the combined command, SHAEF was in fact exercising some of the flexibility Clay wanted. In the last week of April, SHAEF had established the Production Control Agency. Under G-4 at all levels, the agency had a strength of 1,400 officers and 5,800 enlisted men-not a great deal less than the entire strength of military government-and a two-fold mission: to secure industrial production both for Allied military needs and for German civilian needs. Nearly everyone tacitly agreed that a third stated mission, to hold German civilian production to the minimum, was meaningless; with the economy at a standstill, the whole idea was to get it going again. In May, production control groups and sections at army and lower levels worked to restart industries, giving priority to agricultural machinery and supplies, food processing machinery, medical supplies, textiles, and construction materials, and, of course, coal, liquid fuels, and lubricants.40 In May, on Clay's advice, SHAEF established the Economic Control Agency. Under G-5, the Economic Control Agency was to deal with prices, rationing and distribution, imports and exports, agriculture, fisheries, and "determination of essential civilian requirements for all commodities." 41 The agency's instructions did not specify assistance for the German economy, but setting it up for any other purpose would have been pointless. WESTBOUND DPs BOARD A TRAIN in the yards at Weimar. For the western displaced persons, the DPX did its best to speed them on their way home. Third and Seventh Armies sent their DPs by train to Metz and to Luxembourg City where the trains were separated, some going north to Belgium and Holland, the others continuing on into France. 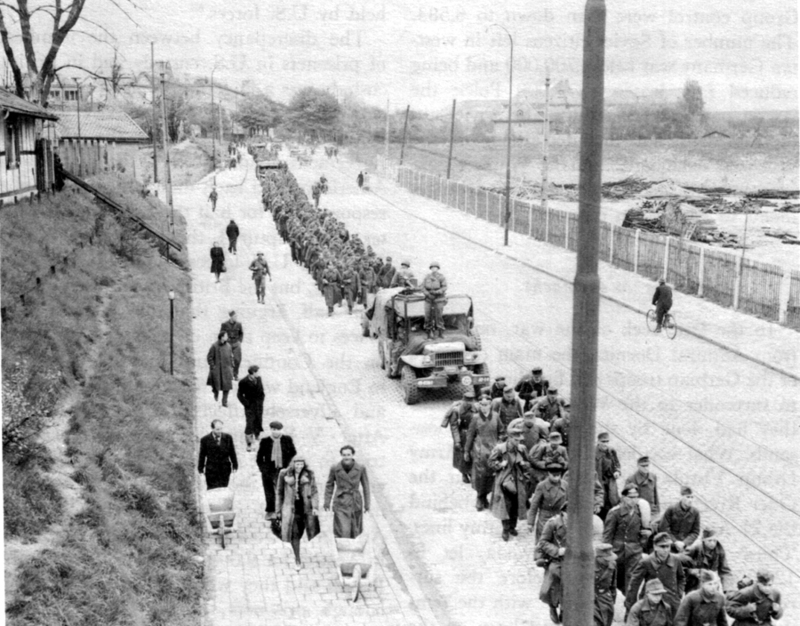 Ninth Army routed its trains to Liege, where Civil Affairs Detachment A1F1 operated around-the-clock sorting centers in which the repatriates were separated by nationality and rerouted to their destinations. Although all DPs were dusted with DDT powder at the 12th Army Group's cordon sanitaire on the Rhine and at least once more when they crossed the German border, a few persons infected with typhus made their way into Belgium and France. SHAEF's "case-finding teams" traced them and dusted their contacts to prevent the spread of the disease.46 At Lauterecken on the most heavily traveled line, the one to Metz, XXIII Corps maintained a rest and feeding point for the DPs. The corps engineers built box latrines along the tracks and laid a quarter mile of water pipe with outlets every twenty feet. Medical personnel ran a delousing station and provided first aid and ambulance service. Every passenger received two-thirds of a day's ration, consisting of canned fish or meat, canned biscuit, and chocolate; and expectant mothers, babies, and obviously undernourished persons were also each given a can of US evaporated milk.47 The record days at Lauterecken were 27-31 May, when almost 55,000 displaced persons passed through. In the camps, the eastern Europeans predominated. Baumholder, the former German Army training center east of Trier, had 17,000 Russians. 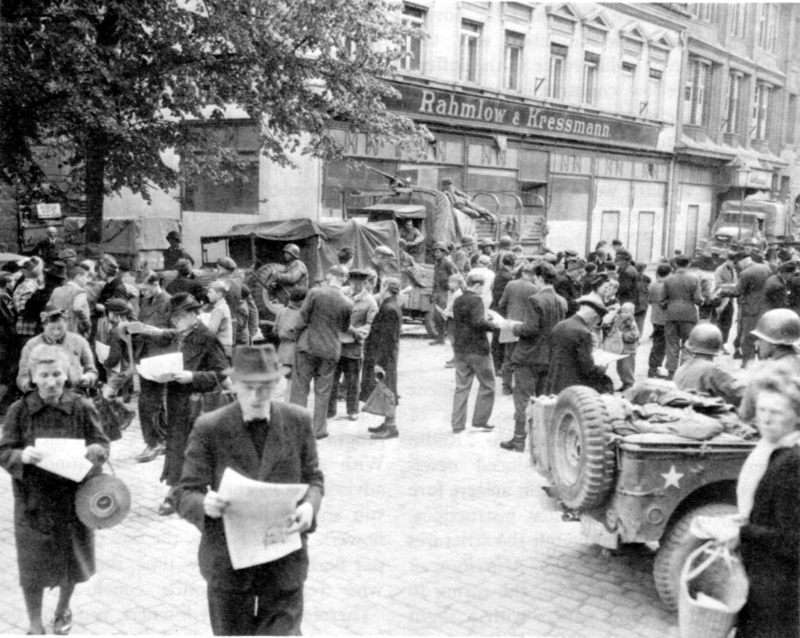 The Army provided general supervision-interior and exterior guards to control the DPs and regulate traffic-and supplied the food-staples and processed foods from the Army Quartermaster Depot in Trier and vegetables, butter, and milk requisitioned from the Germans. Soviet liaison officers ran the camp on a military basis. Each barracks had a leader who took roll once a day. The DPs operated a shoe shop, tailor shop, and bakery and cooked their food in big German Army kettles. An UNRRA DP team handled the paper work, ran a kindergarten and a school for older children and staged concerts and shows in which the DPs performed. Nevertheless, Maj. Marvin A. Jones, 161st Field Artillery Battalion, the US officer in charge, was appalled by the Russians' cavalier attitude toward life and believed the relatively low mortality rate only proved that the Russians had "constitutions of iron." Seventeen DPs, however, had died from drinking wood alcohol. Patients in the hospital, he said, "started running around" as soon as they felt a little better. The Russian nurses did not know how to plot a fever chart, and the Russian doctors mixed typhus and tuberculosis patients in the same wards. each; gave them physical training and military drill; and set up guard and police forces and a jail. 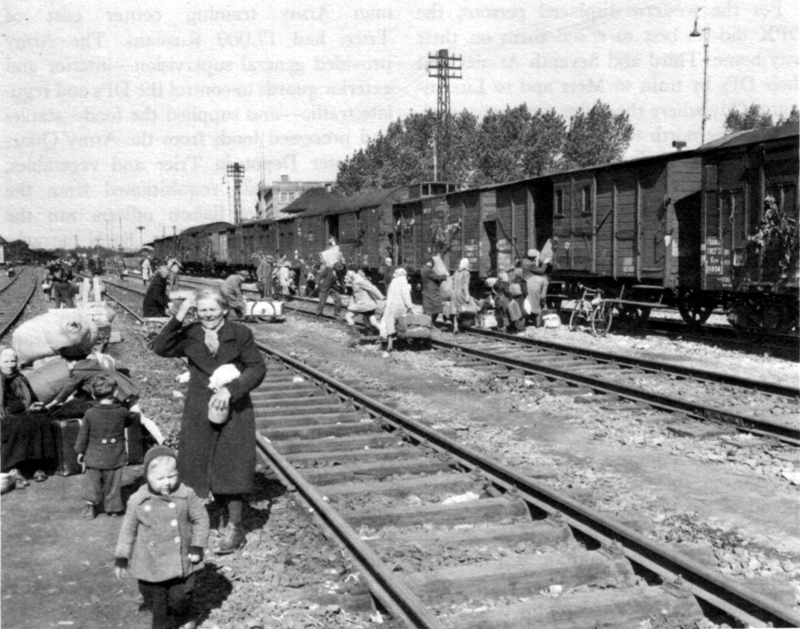 At the end of May, when repatriation to the Soviet Union began, the Homburg camp became a transit stop. The eastbound trains were loaded at the Homburg railhead, and each day trucks from other camps brought in DPs scheduled for shipment out the following day. During their overnight stay they were given a medical check and some entertainment. The next morning, they boarded trains to the accompaniment of Russian hand music. The Army provided four days' US rations, water, and medical supplies, and the men of the 110th Infantry collected toothpaste, chewing gum, candy, and cigarettes to give to the DPs. On 16 May, Maj. Gen. Ray W. Barker, SHAEF G-1, went to Halle, twenty miles northwest of Leipzig, to meet General Golubev, coming from Moscow via Berlin, and to arrange with him a system for exchanging DPs and liberated prisoners of war across the demarcation line. Barker had with him Brig. Gen. Stanley R. Mickelsen, Brig. R. H. S. Venables, and a small party of technical services officers. Golubev came with forty officers, including six major generals, and fifty enlisted men in a convoy that included a U.S.-built armored car and a fully equipped radio truck. The Russians were armed with pistols, submachine guns, and rifles. The next morning, at their first meeting, Barker proposed sending airplanes at once to bring out the US and British prisoners of war. After making some excuses about there not being serviceable airfields-which Barker knew was not true and said so-Golubev made it "very clear that neither now, nor any time in the future, would they permit Allied Airplanes to be used for movement into or out of their territory of prisoners of war or DPs . . . ." The Russians then brought out their plan for the exchange. Obviously written in Moscow, it was cast as a legal document, and its tenor was "to extract compliance to the last degree" with its provisions and with the agreements made at Yalta. Among its specific provisions were some that would have allowed Soviet repatriates to take with them unlimited amounts of "personal effects" and up to 600 pounds of food per person, that would have required SHAEF to provide each repatriate with three days' rations at the exchange point, and that would have prohibited any movement of the repatriates on foot as long as they were on SHAEF territory. During the talks at Halle, Barker proposed converting his and Golubev's groups into a permanent committee to deal with repatriation questions. Golubev refused but announced that he wanted to send Maj. Gen. S. Y. Vershinin and 162 Soviet contact personnel into western Germany to minister to the "hundreds of thousands of Soviet citizens [there] under difficult conditions and more than ever in need of the support of our officers." When Barker asked him whether he would let the French, for example, do the same on Soviet territory, Golubev was noncommittal. Barker later told General Deane at Military Mission Moscow, "A scheme such as this amounts to creation of a Soviet empire in the SHAEF area, which would give them boundless opportunity for criticism-also intelligence." When Golubev, several days later, cabled from Moscow to "demand insistingly an immediate decision," Barker told him that General Dragun, the chief Soviet liaison officer, already had 153 Soviet liaison officers under him and no new organization was needed. PRISONER OF WAR COLUMN marches through Munich.